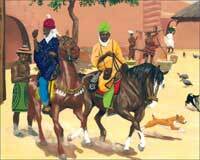 Obara thinks his job is boring – opening and closing the gate into town. He envies his neighbors and feels sorry for himself, until a turn a fate makes him rich! After he has so much, Obara learns an important lesson about what is really valuable. The great thing about this unusual tale is its many twists and turns, and every time you read it, you can learn a different lesson. 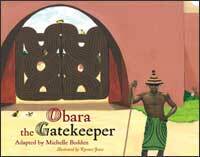 Just like in real life, things aren’t so cut and dried, which makes Obara the Gatekeeper a terrific, character building addition to any library. Dr. Michelle Bodden-White has been an initiated Yoruba orisha worshipper for more than thirty years. She holds a doctorate in Educational Leadership and has worked with students of all ages from kindergarten through adults in both New York City and Cincinnati, Ohio. Painter Quentin “kwenci” Jones has been an artist all his life. His inspiration for the illustrations in this book came from his respect for the awesome beauty of nature.